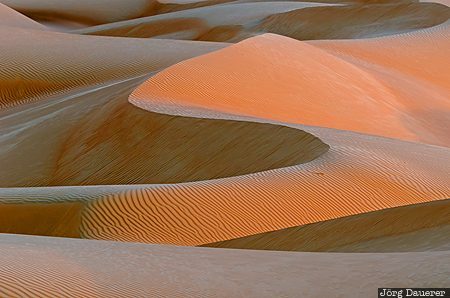 The endless sand dunes of the Wahiba Sands desert (also known as Ramlat al-Wahiba or Sharqiya Sands) illuminated by warm evening light. The Wahiba Sands desert is in Ash Sharqiyah in the Sultanate of Oman. This photo was taken in the evening of a sunny day in March of 2012. This photo was the image of the month in June of 2014. This photo was taken with a digital camera.